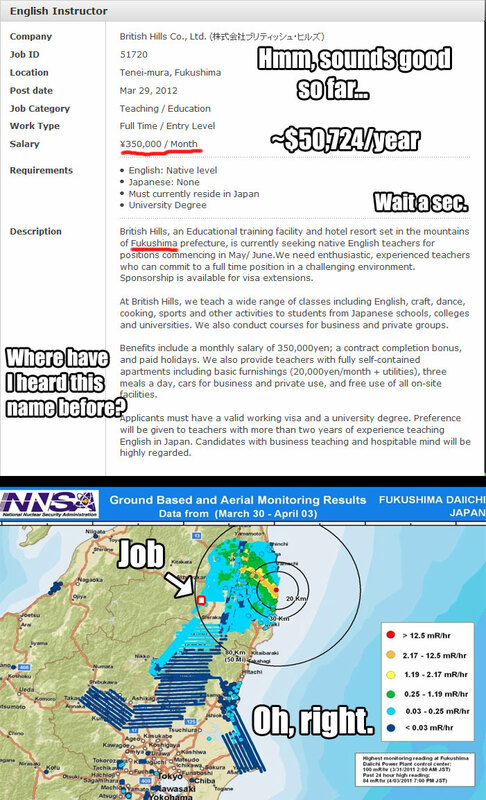 While my attempt at gainful employment in Japan via the JET Program didn’t pan out, I did spend some time browsing some other openings. One of the practically universal requirements is for you to already live in Japan, which requires a work visa, which requires you to already have a job before coming over, which is a Catch-22 so perfect that Joseph Heller filed a posthumous injunction. I sometimes forget that Mongolia is still a real place. I obviously picked the wrong career path. And, presumably, gender. Posted on May 18, 2012, in Miscellany and tagged Japan, JET, Photo Limbo. Bookmark the permalink. 11 Comments. 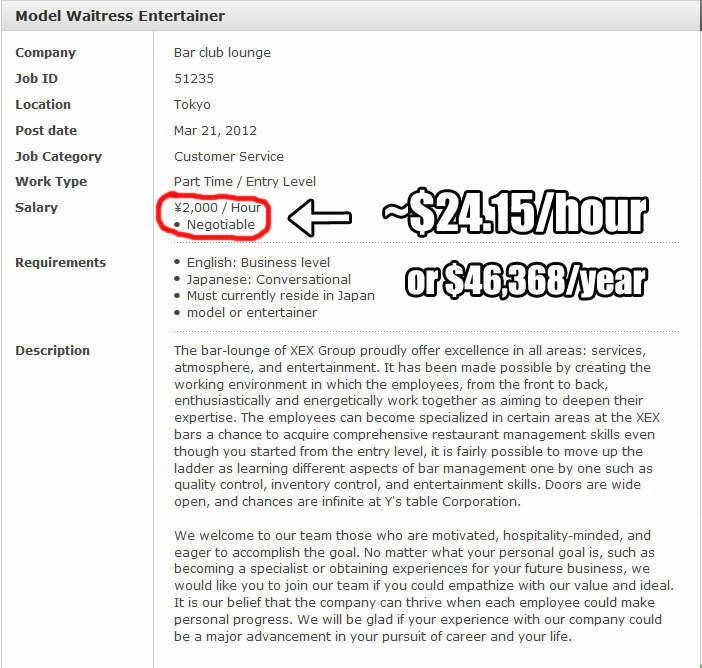 I think the waitress job is probably a hostess job..
You can get a tourist visa for 3 months. I’m pretty sure though it’s practically impossible to get change the visa from tourist to work. Your employer will apply you for a work visa. You used to have to leave the country and come back, which usually meant a day in Seoul, but I think they have changed that. But… hmm. Perhaps it is not as Catch-22’d as I think. As for the money being offered, it doesn’t seem that impressive from what I hear is the cost of living in Japan from friends I have who currently live there. Check it out carefully. I’ve lived and worked on 4 different continents and met many people who didn’t do the sums properly in their desperation to get a job. I was saddened by the Fukushima position precisely because a fully furnished room + 3 meals/day were being provided for $253/month (with utilities being whatever). Quite literally, a bargain at twice the price. I don’t think the radiation level at that location in Japan would be anything to worry yourself about. Or even the level considerably closer to the accident site. There’s a lot of overwrought radiophobia around that really isn’t justified by even conservative assumptions about the effects of radiation. I’d do a lot of things for $215/month rent, company cars, and 3 catered meals a day.